If you’re in the market for an easy to use, no frills grill then the Old Smokey Charcoal Grill #22 (Large) is the one for you. This grill offers a straight forward product for all your grilling needs on a large size. You can grill up for your friends and family all your favorites such as burgers, hot dogs, steaks, and more. This large grill offers you ample cooking space, easy cleanup of ashes after you’re done, and so much more. The double handles on the grill make it easy to maneuver around to exactly where you want it to be. 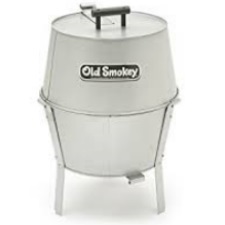 Check out the Old Smokey and why so many people just like you are choosing to add this to their grilling kitchen needs. The Old Smokey Charcoal Grill offers a large grilling surface that covers 21” of grilling space. This allows you to cook a large amount of food at one time so that no one is left waiting for their burger to come off the grill. Invite over your friends and family to have a fun end of summer BBQ or a midweek dinner of delicious grilled chicken or steak. The larger surface allows you to cook a variety of foods at one time without something getting cold while the other is cooking. The grill also offers two safe handles on the side to help you pick up and move the grill should you need to once you’ve got it set up. Grills sit outside in the elements and can sometimes tend to have issues with rusting or damage from the weather. The Old Smokey Grill is made of a rust resistant steel that is aluminized to make it easy to prevent rusting from being in the elements. This will help to keep your grill around for a long time to come so that you’re able to cook delicious meals for your family every time you fire up the charcoal. The grill is made in the USA and offers a great product for all your backyard grilling needs. When this review was written, there were 77 reviews on Amazon alone about this particular Old Smokey model. The consensus seems to be that everyone who purchased it enjoys the item. The grill received 4.4 out of 5 possible stars as a rating from consumers. While the response was mostly positive, there were around 7 critical reviews that had issues with the grill. Those who found issues stated things such as it was better suited for a large crowd and not a smaller family grilling, the grill rusted out in two years, and there was one consumer who was unsure about the actual smoking capabilities that the Old Smokey Grill provided. For those who were in favor of the grill, the remarks were very high and they absolutely loved their choice. The grill is very inexpensive and provides you with a large cooking surface. Those who enjoyed the grill said things such as … “Really like the grilling results” … “Looks are deceiving” … “Nice little smoker” … “Diamond in the rough” … “Love this grill” … “Five stars” … “Awesome!!”. At less than $100 to purchase, the Old Smokey Charcoal Grill #22, Large size, is a great investment for your backyard cooking arsenal. It allows you to cook for a crowd of friends and family all at once without having someone eating a cold meal. This fantastic grill option is the perfect no-frills grill for that griller in your life who just loves the simplicity of fire and meat. Consider the Old Smokey Charcoal Grill #22 for your backyard patio, deck, or kitchen area to get some delicious items on the table each time you fire it up. With the spacious 21” grilling surface, double side handles, and lightweight, this grill is perfect for your backyard BBQ all summer long.